Why so excited? 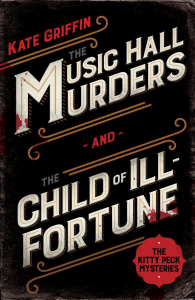 Well, having previously loved Book 1 (Kitty Peck and the Music Hall Murders) and Book 2 (Kitty Peck and The Child of Ill Fortune), I was awaiting part three of the series with plenty of anticipation. The biggest problem I have with writing this review is my desire not to ruin either this novel, or the two that come before it, for you. Books one and two were amongst the best Victorian crime thrillers I’ve ever read. Kitty Peck is unique amongst its peers. It weaves a world of darkness together with a fierce lightness which shines from the loyalty of her friends- but now even those long term alliances are under threat. As I read, I could feel Kitty’s total frustration. She can’t do what she wants to do any more- she can’t even do what she knows is the right thing to do. Kitty’s every move is tied into knots by the looming twin spectres of Paradise and her domineering- even while absent- grandmother. Attempting to escape the guilt that has become part of Kitty’s lie- a consequence of events at the end of book two- Kitty turns to opium- but even in her drug fuelled dreams she is hit by the remaindered of what she has been forced to do to survive- and what she must do- and the price that will be paid to do it. 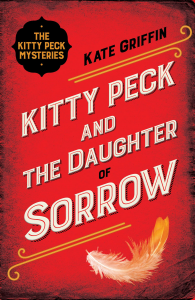 Kitty Peck and the Daughter of Sorrow is tense, fast paced, enthralling, and every single word is worth reading. As with books one and two, not a single sentence is wasted. Every paragraph moves the plot along at such a pace, that you will not want to put the book down once you’ve started to read it. With the support of Peggy, Lucca, and her grandmothers Chinese bodyguards, Kitty Peck must keep Paradise going. So many people depend on Kitty for their livelihoods- without her they’d be on the streets. After all, Paradise is only one step from hell. 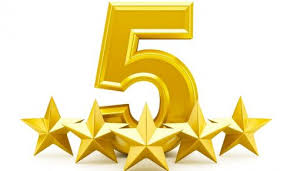 I have no hesitation in awarding Kitty Peck and the Daughter of Sorrow 5 stars. Dancing girls are going missing from ‘Paradise’ – the criminal manor with ruthless efficiency by the ferocious Lady Ginger. Seventeen-year-old music hall seamstress Kitty Peck finds herself reluctantly drawn into a web of blackmail, depravity and murder when The Lady devises a singular scheme to discover the truth. But as Kitty’s scandalous and terrifying act becomes the talk of London, she finds herself facing someone even more deadly and horrifying than The Lady. Kitty Peck and the Child of Ill Fortune– March 1880, Limehouse. Kitty Peck, a spirited but vulnerable seventeen-year-old, is the reluctant heiress to Paradise, the criminal empire previously overseen by the formidable Lady Ginger. Far from the colour and camaraderie of the music hall where Kitty had been working, this newfound power brings with it isolation and uncertainty. Desperate to reconnect with Joey, her estranged brother, Kitty travels to Paris. Reunited at last, she is unable to refuse his request to take a child back to London. Within days of her return it’s clear that someone has followed them… and this someone is determined to kill the child… and anyone who stands in their way. Kitty Peck and the Child of Ill-Fortune is a fast-paced historical mystery with breath-taking twists and turns that takes us from the decadent, bohemian world of late 19th-Century Paris to a deadly secret at the heart of the British empire.